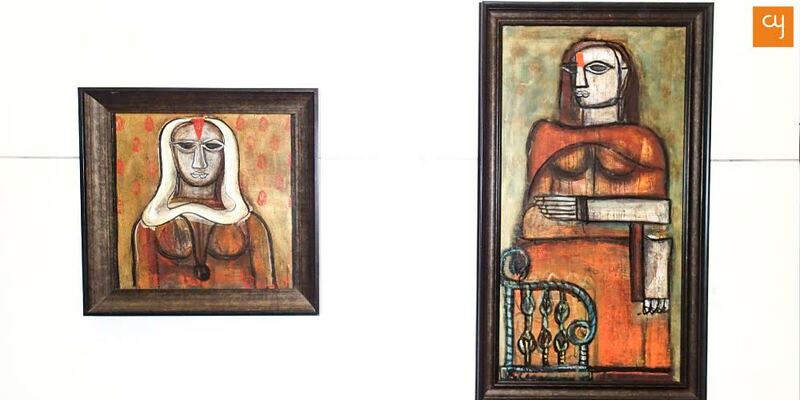 The Bangladesh born artist Rini Dhumal prefers to express through art, than to do it with words. 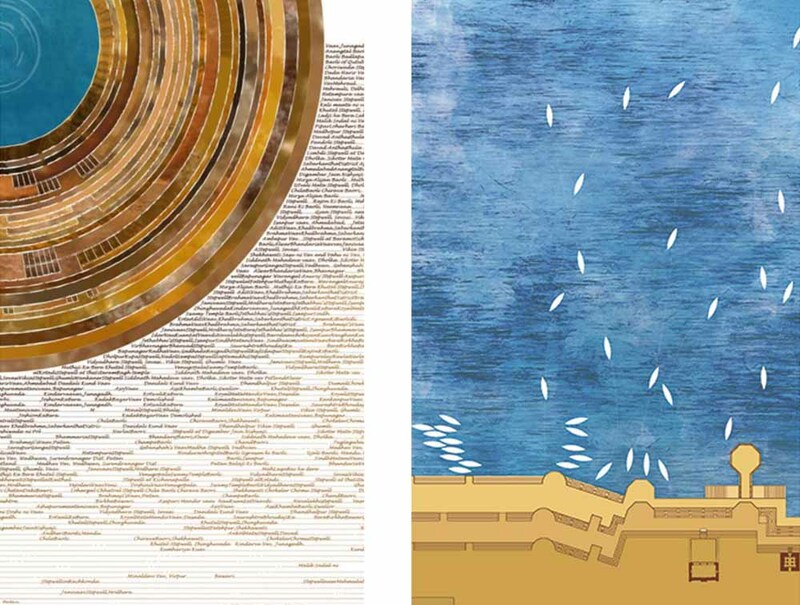 Evident in her repertoire, on display at the ongoing show ‘Smartavya’ is her penchant to express. 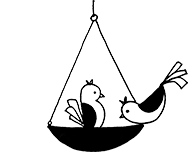 Presented by Catharsis Art Gallery and curated by Kirti Parihar the show provides the viewer a glimpse into the artist’s pathos, aspirations and beliefs that come alive through feminine forms and spiritual energy of her art. The solo show of the Vadodara based artist, printmaker and sculptor will remain open at Kanoria Centre for Arts until October 25. Art, in my opinion is a creative way of personal expression. Few art pieces make you feel as if the subjects within the artwork are breaking the boundaries of canvas to come into life. The use of textures, the flow of strokes, the play of colour and medium, it all adds to enlivening of canvas. 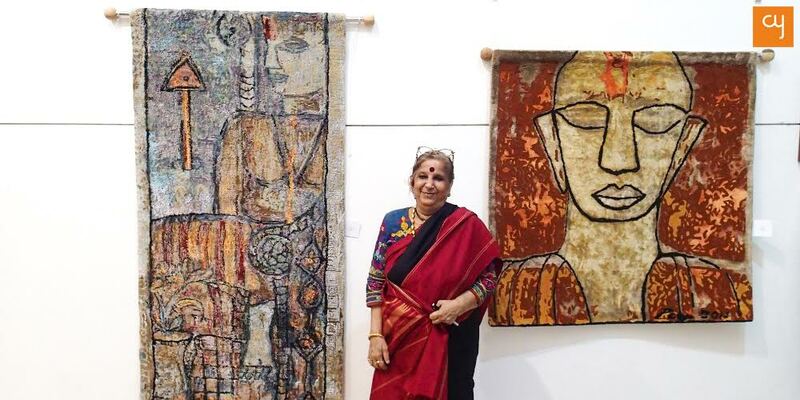 ‘Smartavya‘, a solo show of Vadodara based veteran artist Rini Dhumal has this and more. From the moment I entered the gallery, the art on display instantly and instinctively absorbed me. The artworks pulled me towards itself, as if narrating me the story of an artist and her journey. From East Pakistan (now Bangladesh) to the western Indian city of Vadodara – Dhumal’s life experiences are deep and varied. The atrocities of partition of India to ideas of divinity – everything reflects in her majestic art. The 60 absorbing artworks of the artist have come alive on multiple mediums like wood, canvas, ceramic, acrylic, tapestry and prints. The show is a commendable attempt to give the viewer an opportunity to have a glimpse of such immense oeuvre. Strolling through the gallery and absorbing the intense and powerful art by Dhumal had enough moments of surprise, largely due to the tremendous control she has demonstrated over these extremely diverse mediums. 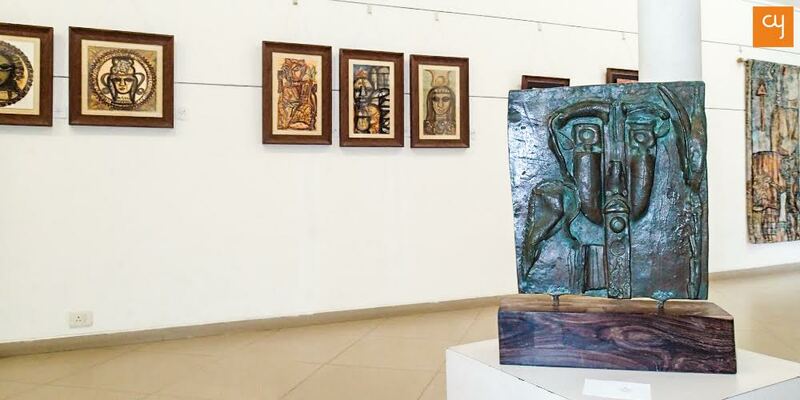 The visitors were enthralled to see artworks on mediums as varied as oil on canvas, acrylic on acrylic, oil on wood, mixed media on paper, watercolour on paper, glazed stoneware, handcrafted tapestry along with 4 gorgeous bronze sculptures. 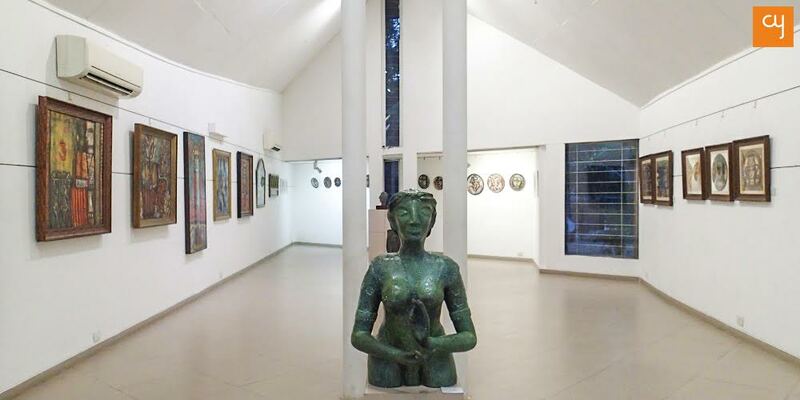 Each object d’art is a tributary of Dhumal’s memory flow and what left most of the people awestruck was the 38-inch high bronze sculpture titled ‘The Green Lady’, placed aptly in the centre of the gallery. Though many figures can be seen in a ‘Mudra’ and meditative state I questioned myself ‘are these deities and goddesses?’ And curator of the show, Kirti Parihar, cleared all my doubts with a beam, saying, “Not per se! When I see Dhumal’s artwork, I can see the independence and power she is trying to deliver to each woman through her feminine protagonists. As a woman, her aesthetics defines my personality – strong, willful, undefined and independent.” It looks like Dhumal is trying to address every woman as strong as a deity in the most captivating and beautiful manner, her bold and confident strokes beautifully convey this feeling. The art of Rini Dhumal has a “diffusive spirituality”, a term expressed instantaneously by art collector Shujaat Mirza upon a post-show coffee chat. What he meant, and I agreed is, that Dhumal’s art has layers of spirituality, often beyond comprehension and yet her competence as an artist shines in her ability to compose the incomprehensible on a canvas. Dhumal, after making a live painting on canvas as effortlessly as one pens a signature on a blank paper rested on a chair and spoke to me, “My grandparents played an important role in embedding the spiritual quotient in me. But the artistic skills developed gradually as I started learning art under the tutelage of Somnath Hore at Shantiniketan in West Bengal. During all these years philosophies of prolific painters, printmakers and sculptors like Sir William Hayter, Krishna Reddy in Paris and K.G. 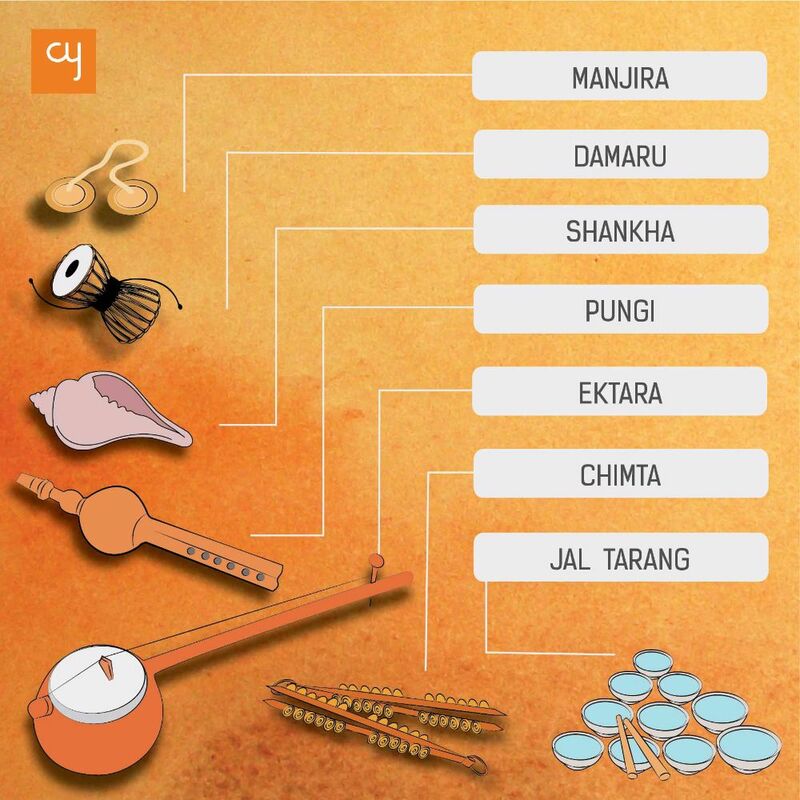 Subramanyan in Baroda helped me in becoming what I am today. But I never stopped sketching.” Honoured with the prestigious National Award by the top cultural body of India, Lalit Kala Akademi, Dhumal encourages young students to sketch more and limit the usage of digital tools, while they are still learning. 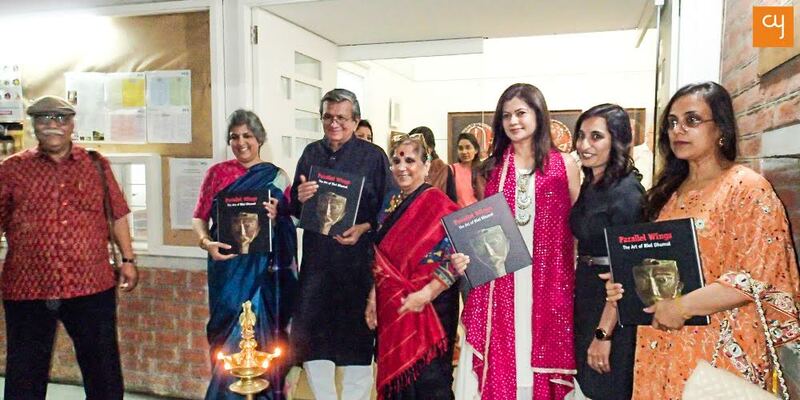 The inauguration honours were carried out by art connoisseur Archana Patel and Ruchira Asnani. Amit Ambalal, who was there to launch a book on Rini Dhumal mentioned, “Dhumal is a disciplined artist. Whenever we go to any art camp, she is persistent in her work. Her energy revitalises as soon as she picks up any new medium.” The inaugural was followed by book launch by Amit Ambalal and Neena Naishadh Parikh. Penned by Sushma K Bahl ‘Parallel Wings – The Art of Rini Dhumal’ chronicles the art and expression of Dhumal. Bahl who has previously drafted famous art books like ‘Forms of Devotion: The Spiritual in Indian Art’ and ‘5000 years of Indian Art’, in this book has put in lot of thought to narrate the life and evolution of Dhumal’s art. The book has foreword by Anil Dharker, a noted columnist of India. The organisers have also kept on display a handpicked collection of print works of Dhumal. As per Parihar, all the displayed works at the show are created recently, not beyond a span of 2-3 years. We spoke with Tejas Shah, co-founder of Catharsis Art Gallery, and he shared his experience of bringing ‘Smartavya’ in Ahmedabad by saying, “Kirti and I have been in contact with Dhumal since 2016, and from past five months we are dedicatedly working for this exhibition. Smartavya is just a short glimpse of Dhumal’s overall body of work. 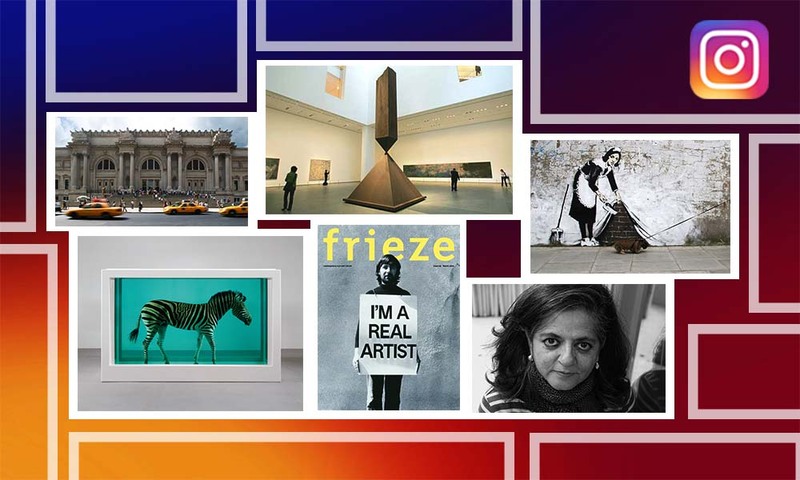 We are contacting museums and galleries across the world now to bring Rini Dhumal’s artworks at a single place for an enormous retrospective.” We really wish that these noble aspirations come alive, real soon. The rare opportunity to witness the captivating works of Rini Dhumal will continue till October 25, 2018, between 11 am to 7 pm at the Kanoria Centre for Arts. Visit this show and give yourself a dose of spirituality, through arts!